Women still have the challenge to make what men make for the same job and to attain the promotions that will place them in leadership roles. But, women have made progress and they can make more. With the current attention employers, the legal community, and the media are paying to the concept of equality and gender fairness, a better time to promote the positive need for more women in leadership roles has never existed. The opportunity has infinite possibilities for a more fair and equitable workplace that takes advantage of the strengths that both genders bring to management and leadership. With this in mind, Susan Lucas-Conwell who is the Global Chief Executive Officer at Great Place to Work® participated in an interview. An accomplished business leader, Susan provides a keen perspective on how building and maintaining great workplace culture drives business success. She is also an expert on how women can flourish in leadership roles in organizations. Susan Heathfield: What are the biggest challenges women face in the workplace? Susan Lucas-Conwell: Many of the challenges that women face in the workplace are the same as those for men. These challenges include work/life balance, parenting, juggling many responsibilities and multitasking. Challenges specific to women continue to be a wage gap—women still earn only 73 percent of what men do for the same job. Discrimination remains present in the workplace; sexual harassment is unfortunately not a thing of the past and the higher up you are promoted, the fewer women there are. There are fewer role models and mentors for women leaders. UC Davis published a study in 2011 that examined the 400 largest companies in California. This study showed that only 9.7 percent of board room seats or top paying executive positions were held by women. Thirty-four percent had no women on their executive board and none of the companies in the study had an all-female board. In addition, none of the companies had a gender-balanced board or management team. Heathfield: How can women overcome these challenges? Lucas-Conwell: Whether perceived or real, women leaders sometimes feel pressure to conform to the male leadership model and if she bends to that pressure, she sacrifices one of her own sources of strength and personal power. The first step toward overcoming any challenge is awareness. Once aware, she can put some queues in place to remind herself to rely on her emotional intelligence and the immediate situation demands rather than conforming to some role model and associated actions she is preconditioned to think is required. Women can overcome this by staying true to and acting from their innate strengths (e.g. creativity and collaboration) in their everyday approach to work and overcoming the inevitable obstacles. Women tend to lead from a more interactive, cooperative style which often results in strengthening the sense-of-team in employees or as we say at Great Place to Work “we are all in this together,” inspiring a higher degree of commitment to strive to achieve the business’ goals. Heathfield: What are the benefits of having women on the executive board? Lucas-Conwell: Primarily, it’s the balance that women bring to an executive board. Simply said, women bring a different perspective based on a different set of life experiences. This perspective can broaden and deepen the executive board’s insight and pre-sight if you will, making it more effective and agile thus, more successful rising to the unique challenges their business faces in their respective market. But having women on the executive board isn’t just the right thing to do—it’s good for the bottom line. 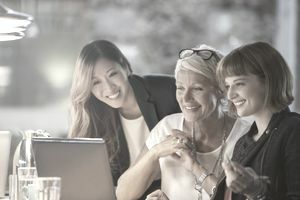 As a recent Catalyst.org study reported, Fortune 500 companies with three or more women on the Board outperform other companies with 53 percent more returns on equities, 42 percent more return on sales and 66% more return invested capital. Yet, for example, according to the National Center for Women and Information Technology, women executives account for only 6 percent of chief executives at the top 100 tech companies. Heathfield: How can women leverage their unique outlook in the workplace? Lucas-Conwell: Women need to identify their unique talents, understand what they bring to their work environment to best enable success, and then, make sure that their voice is heard. Speak up, speak out, and contribute. Women may experience difficulty with this in many work environments. So, it’s important to find a community within the organization—mentors, role-models, networking groups—who can help navigate through an organization and provide a support system. Heathfield: How can organizations recruit, retain and develop women leaders? Lucas-Conwell: In the best workplaces/companies, significant attention and resources are focused on recruiting, retaining and developing women leaders. It’s not only the right thing to do, but it’s also smart business. There is no one-size-fits-all approach to recruitment, retention, and development. Significant emphasis is placed on the benefits that an organization can offer. Onsite childcare, maternity benefits, women’s networking groups, mentoring and development are important to women. But, ultimately, an organization that genuinely cares about their women employees will keep their women. We have found that those companies that have active policies in place that ensure equal rights for women and have taken active steps to redress that imbalance are most successful. We encourage organizations to give thoughtful attention to creating a gender-neutral environment. To do that, they must first truly understand what women in the organization want and need from their employers. What do they value? For some, it may be the option of flexible work arrangements or job-sharing. For others, it may be employee resources groups and mentors. Some of the best organizations have women’s task force groups that they can ask to better understand what women need and value most. If women aren’t staying at the organization, it’s important to know why and what can change to better enable them to stay for the long-term. Once this has been determined, the next step is to implement these programs, policies, and practices and to measure them for effectiveness. Heathfield: What changes do you forecast for women leaders in the workplace in the next five to ten years? Lucas-Conwell: As flexibility gets baked into how we do the work we do in organizations, flextime, work from home and virtual workplaces become the norm, we’ll see more balance in the numbers of men and women at the leadership table, especially more women at the head of the table. And op-eds like Anne-Marie Slaughter’s, “Why Women Can’t Have it All,” will have shifted in tone to how the workplace enables us all, men and women, to have it all, however, we define it. Heathfield: How can we encourage more women to go into the high paying and job-almost-guaranteed fields of science, technology, engineering, and math (STEM careers)? Lucas-Conwell: We need to approach this from two angles. First, there has been a slew of research that shows the value of exposing girls to STEM subjects early on. As a mother of girls myself, I speak from experience when I say that we need to encourage their curiosity and natural interest with programs and activities which keep the spark alive. However, we also need to lead by example. We need to celebrate the women who have been trailblazers in these subjects so that from a young age, women have more role models with whom they can identify. We have more women CEOs in the technology sector than we’ve ever had before—from Yahoo! to IBM. But, we still have work to do at the middle management levels to increase the number of women at these companies. As that number, hopefully, increases, this too will help as they will, in turn, be mentors, leaders, role models and mothers to young girls. And, this is a good thing for workplaces world-wide. Trust this.